In How to Live, Judith Valente explores the key elements of the rule and clearly demonstrates how incorporating this ancient wisdom can change the quality and texture of our lives offering a way forward from the divisions gripping our country. Atchison Blue: A Search for Silence, a Spiritual Home and a Living Faith. Judith's observations and lessons learned from extensive visits to Mount St. Scholastica Monastery in Atchison, Kansas. 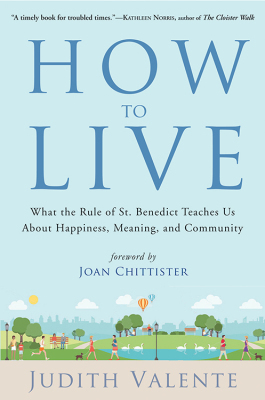 Named "Best Spirituality Book in Paperback" by the Catholic Press Association and one of the "Three Best Spirituality Books of the Year" by the Religion Newswriters Association! Special thanks to David Crumm, Editor of ReadTheSpirit online magazine and publishing house, Co-founder of Front Edge Publishing, for devoting the cover of the November magazine to How To Live. See the feature in ReadTheSpirit by clicki nghere: https://www.readthespirit.com/home/. The Art of Pausing: Meditations for the Overworked and Overwhelmed. 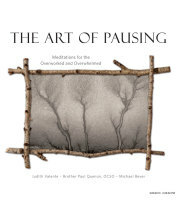 "The Art of Pausing is a unique book for people who know they need to slow down but aren't sure how to do it... This is the perfect gift for yourself or for anyone you love who is "overworked and overwhelmed," which is most of us on most of our days." A Collection of Poems by Judith Valente. "[Her poems] own their own beauty, offer themselves abundantly to metaphor. Ms. Valente has constructed an active, even frisky language, pulling into the poem references and allusions that tease our minds as they amplify the poem's subject and mood and landscape." "This is a thoroughly engaging and illuminating book. Judith Valente and Charles Reynard show us how we, too, can enter a poem through the openings our own lives give us."